The UAE has impressed the world for many reasons, as it quickly becomes one of the most innovative leaders in technology, education, finance, and infrastructure. The country’s awe-inspiring vision and commitment to create a modern yet sustainable nation with their advanced technology and opulent buildings, continue to break many world records. And that’s not the only record they’re after. As one of the steadiest rising nations to increase their global mobility score, the UAE has been moving up the ranks of The Passport Index much quicker than they anticipated with their UAE Passport Force Initiative. This month alone, their ranking will increase by +3, as they gain visa-free access to Brazil, Honduras, and the Kingdom of Tonga by the beginning of June. This will bring their total Visa-free Score to 147 and their Global Passport Power Rank will jump up to 18th place, beating Hong Kong’s, Andorra and San Marino ranks. The UAE already holds the most powerful passport in the entire Middle East, and at this rate, it could be on its way to become one of the most powerful in the world. The Passport Index is the world authority on real-time global passport ranking. 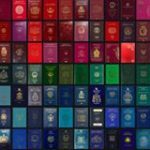 Used by governments from around the world to monitor and increase the power of their passports, The Passport Index is the most recognized and trusted service with nearly 14 million users to date.